In all my years of being a dentist in Charlotte, NC, I’ve heard a lot of interesting stories from patients about bad experiences. No doubt, the large majority of them are true, but there are a few dental myths out there that always give us in the profession a good chuckle. One of my personal favorites is this one. 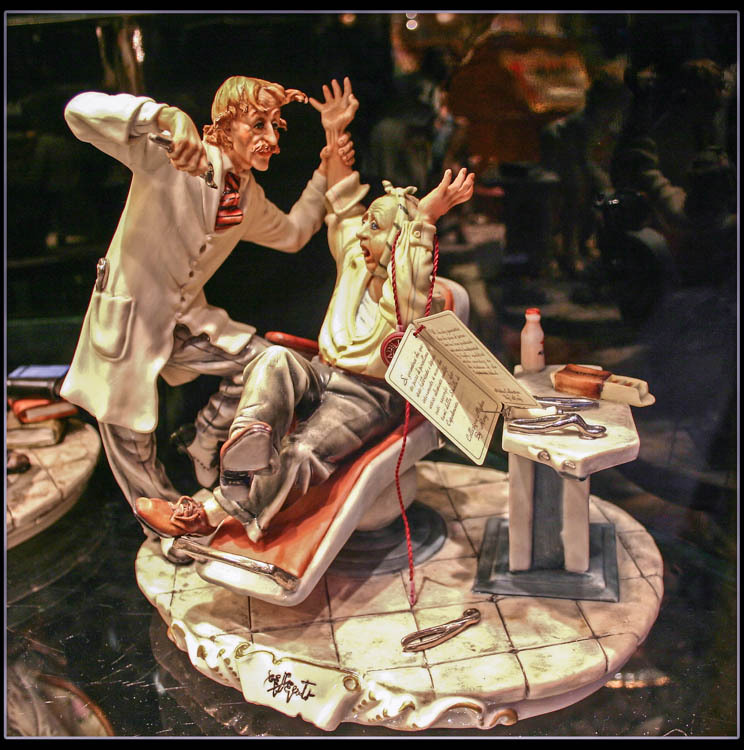 As is portrayed by Steve Martin in The Little Shop of Horrors, and as seen in this photo I took of a ceramic piece in Italy many years ago, dentists really have a bad reputation. From talking with many of my colleagues, though, I promise that most of us can’t stand hurting anyone and go out of our way to make sure you’re ok. When it comes to taking out teeth, however, there are limits to what we can do. Of course, we’ll numb you up super well to make sure there’s no pain, but we can’t take away the pressure involved in pulling a tooth out of your jawbone. Some teeth come out really easily if they have bad gum disease or small roots, but if you have strong bone and big roots, some teeth are much harder to remove. Of course, there are techniques to make them easier, but that still doesn’t make them easy. Knee vs. Chest vs. Tooth: Which Will Lose First? Dr. Payet is 160 lbs. Let’s say patient “Ms. Smith” is 110 lbs. Dr. Payet stands on one leg (has to balance on just 1 leg now) and puts his knee on Ms. Smith’s chest. What happens to Ms. Smith? Dr. Payet triumphantly holds up the tooth until he looks down and realizes that Ms. Smith is dead. OOOOPS! Even if we change the scenario to Mr. Smith, the 225 lb. plumber, the whole “head-yanking/rib-crushing” thing would still happen because of leverage. Maybe not to Mr. Smith the ex-NFL linebacker who weighs 250 lbs. of solid muscle, but how the heck would I get my knee on his chest anyway? And you think he’d let me!?!?!?! Thankfully, this scenario has never happened, and it never will. But that’s the point, right? In all seriousness, if a dentist put his/her knee on your chest and tried to yank your tooth out while putting their full weight directly on your chest – YOU DIE! And trust me when I say – we dentists REALLY don’t like dead patients – it’s REALLY bad for business! Police swarming the office……picture all over the front page of the paper………jail time……….NO THANK YOU! OK, I’m being a bit over-the-top there, but you get the point…..no dentist ever wants a patient badly injured, in the hospital, etc., which is what would happen. So no, it’s never happened except in your nightmares or maybe while you were having loopy dreams on laughing gas or in a bad “B” horror flick. Trust me! [UPDATE TO ARTICLE ON FEB. 2ND 2016] In response to a discussion with someone online, I decided to make an actual video demonstration of why this truly doesn’t happen, no matter how much you might think it does. IT DOESN’T! So there you have it – dentists will NOT put their knee on your chest to pull a tooth. If you’ve got photo or video evidence to prove me wrong – let’s see it! If not, please help spread the word – SHARE this to Facebook, +1 it on Google+, Pin it on Pinterest, Tweet it on Twitter, or wherever you can!